What Are the Health Advantages of Almonds? 2 What Is the Recommended Intake of Almonds per Day? Almonds are a rich source of energy and essential nutrients. For children, almonds form munchies; for adults on a weight loss diet, they form healthy snack options. Almonds are rich in proteins, fats, magnesium, carbohydrates and more. Almonds may be eaten roasted or raw. Almonds can also be consumed in the form of oil, butter, flour or almond milk. In whichever form you consume them, they provide your body lots of healthy nutrients. However, as excess of anything is bad, the similar rule is applicable to almonds. Ingesting large amount of almonds may result in weight gain. Since almonds are high in fats and calories-one oz contains 164 calories and 15 grams of fat-the recommended serving size is 1 ounce. You can gain one pound of weight if you eat 3,500 calories in addition to the amount you burn, so by adding 500 calories in your diet every day for one week, you may gain weight. Hence, if you eat about 3 ounces of almonds per day without counting their calories in your daily meal, you may gain one pound in a week. Though almonds contain healthy fats, still by eating 3 ounces of almonds you get 45 grams of fat. You should limit your consumption of fat to 20-35% of your total daily calories, or 45-80 g if you are following a diet of 2,000 calories so as to avoid any gain in weight. Almonds contain high amount of manganese with one ounce containing 0.5 mg of manganese. You require 1.8-2.4 mg of the mineral per day for normal functioning of your body. Hence, if you eat almonds in excess along with a diet rich in manganese, this may lead to medicine interactions-one of the side effects of almonds. High blood levels of manganese may interfere with certain antipsychotic drugs along with laxatives, antacids, some antibiotics and blood pressure drugs. Almonds are a rich source of Vitamin E, which is an antioxidant. One oz of nuts provides 7.5 mg of vitamin E, which is around ½ your daily requirement. 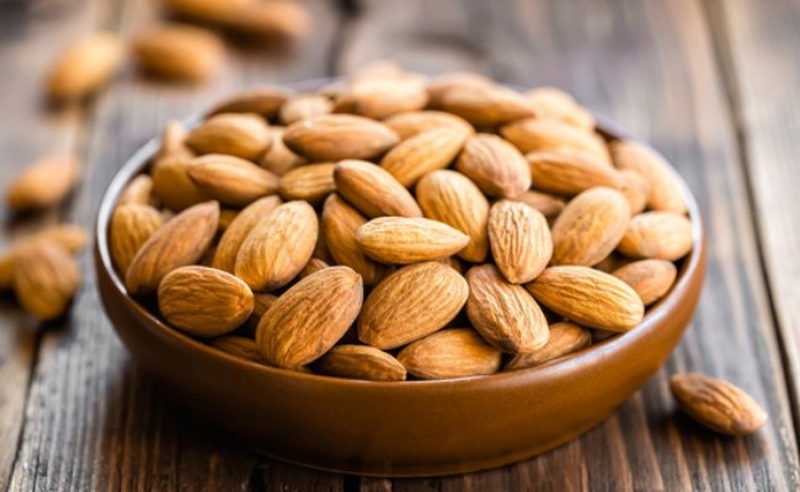 Though you have to eat lots of almonds for rising above the upper limit of vitamin E that is tolerable by the body (1,001 mg/day); however, it is quite possible, especially, if you ingest a diet that contains foods rich in vitamin E such as fortified cereals, eggs, whole grains and spinach. Excessive vitamin E can lead to symptoms of overdose of the vitamin such as lethargy, blurred vision, headaches, flatulence and diarrhea. 3.6 grams of fiber is present in 1 oz of almonds and you require 25-40 g of fiber per day to prevent constipation and diarrhea. However, consuming almonds in excess may cause abdominal bloating and constipation in case your digestive system is not used to process large quantities of fiber. If you eat lots of almonds, also drink water with them so that you body can handle the intake of fiber. Almond is a rich source of oxalate, which can result in kidney stones-another of the side effects of almonds. Calcium absorption is prevented by oxalates; thereby, resulting in buildup of calcium in your kidneys. Moreover, your body accepts the oxalates present in almonds more readily in comparison to other types of dietary oxalates. Hence, in case you have kidney stones avoid almonds or eat them in moderation. If your vitamin E intake per day is between 26 and 537 mg, then the mechanism of blood clotting in your body may get impaired. It may also raise your risk of getting a stroke (hemorrhagic). Hence, don’t eat almonds or consume almond milk in excess. Hydrocyanic acid or cyanide is present in bitter almonds in toxic levels and it is a type of poisonous compound. Though bitter almond helps in curing pain, itch and spasms, over-consuming it can lead to serious complications such as choking, nervous breakdown and even death. Bitter almonds are strictly not advised for lactating and pregnant females. In case you suffer from tree nut allergy, you can develop serious side effects of almonds such as rashes, breathlessness and swelling in mouth by eating them. In extreme circumstances, ingestion of almonds can result in anaphylaxis, potentially severe and life-threatening reaction. Some individuals may also develop allergic symptoms after using oil of almonds on the hair or skin. Bacteria may grow on almonds and this feature is common to all nuts. Harmful bacteria may grow on almonds depending on the location where they are cultivated and grown and this can result in adverse health effects if they are eaten without cleaning them properly. In fact, it is considered illegal to sell raw almonds in some countries. They help in reducing the risk of heart attack. According to estimates, the heart attack risk is reduced by 50% in people who eat nuts 5 times per week. They help in reducing bad cholesterol levels. According to the results of a clinical study, almonds have beneficial effects on the levels of blood cholesterol. They help in protecting the walls of arteries from damage. According to a research, flavonoids present in skin of almonds work in association with vitamin E in decreasing heart disease risk. They help in building strong teeth and bones. This benefit is made possible due to the phosphorus present in almonds. They help in reducing the increase in insulin and blood sugar levels post meals. They help in proper functioning of the brain. Almonds are a source of L-carnitine and riboflavin, nutrients which boosts activity of brain and also helps reduce Alzheimer’s disease risk. They help in nourishing the nervous system. Ayurvedic experts state that almonds help in increasing longevity and intellectual levels. To conclude, now that you are aware of side effects of almonds, take care while consuming them and stay safe and healthy. There is no denying the fact that almonds are healthy for your body; however, you should eat them in moderation. What Is the Recommended Intake of Almonds per Day? According to the FDA (Food and Drug Administration), you should restrict your daily intake of almonds to not greater than 40 g or 1/3 cup. Discuss with your dietitian to determine how much almonds per day will be good for your health.